As a filmmaker, you're going to experience periods of creative drought—just as all other storytellers do. When you’re burned out, bored or in a rut, it can be impossible to focus on your story and reach your creative potential. But don’t get discouraged—there are ways you can rekindle your creative spark. Let’s be clear: there is no magical formula, but we’ve found a few tried-and-true ways to find the inspiration needed to light a creative spark. Here are 5 ways of our favorite ways to get out of a rut and continue down the path of telling amazing stories. If you’re in a rut, ask yourself: Do you feel overwhelmed with your creative projects? Or, on the flip side, are you getting bored with tasks that seem routine? In either case, it might be time to pick up some new skills. Believe it or not, learning something new is one of the best ways to push outside of your comfort zone. And, as filmmakers, there’s always so much exciting stuff happening that you have almost unlimited opportunities for furthering your education. But that can also make the whole notion a bit overwhelming. If you don’t know where to begin, start by identifying your strengths. What are you really good at? What tasks do you enjoy the most? Then, identify some areas where you could use some improvement — and be honest with yourself. What challenges you the most? What stuff do you hate? With a clearer picture of your abilities, consider taking a class and joining an online film school like the Academy of Storytellers. Focus on your areas of weakness as opportunities to grow, and you’ll be amazed by how it can refresh your creativity and reignite your love for storytelling. 2. Collaborate to get a fresh perspective. When you’ve been nurturing your story, it becomes a part of your family. We can often treat our creative projects like offspring: they frustrate and test us, but they still share our DNA. So, when it comes to bringing other people into the mix, we have a tendency to get protective of our creative offspring. But when you’re looking to reignite your storytelling passion, a supportive and encouraging community can bring fresh ideas and different levels of expertise to rejuvenate your process. Plus, learning from friends can be fun in addition to being a challenge. Great collaborators keep you focused on the goal of telling an amazing story. Sharing your creative project can be scary, but this is exactly why it’s an excellent idea to let other people help you. When you bring in collaborators, you’re raising the stakes. This creates positive pressure. Plus, your community will be invested in your story, and they’ll keep you on track. Fear is a tricky emotion. Sometimes we have rational fear that protects us from physically dangerous situations. 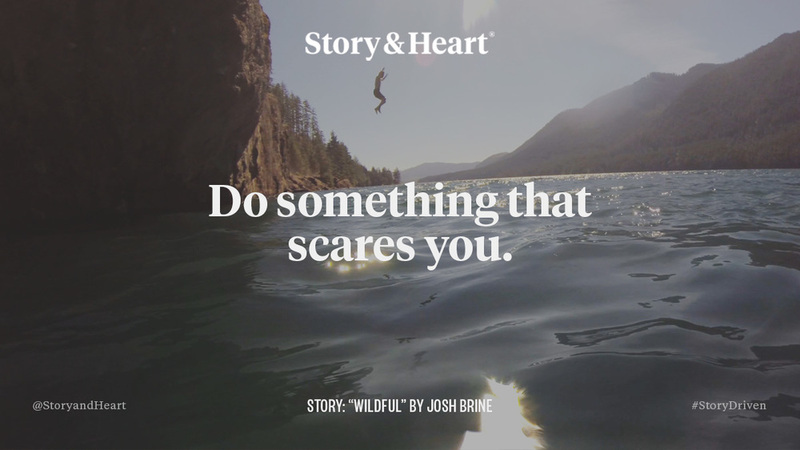 But, when it comes to us storytellers, our fear is often an irrational fear of failure. Sure, no one likes to get things wrong. But if we’re not doing something challenging, our creativity shrivels up like a dried fig. Eleanor Roosevelt famously said, “Do one thing every day that scares you.” And we can’t think of better advice for those who feel like the inspiration has fizzled. If you’re looking to rekindle the fires of creativity, do something that you’re afraid. Get uncomfortable. Push yourself into new territory. Now, we’re not telling you to be reckless with your business or your creative partnerships. To the contrary, it’s a good idea to challenge your skills in a safe environment. For example, find a project where it’s safe to make mistakes and get stuff wrong — then take the leap! 4. Take a break to do something unrelated. At first glance, you might think taking a break is counterproductive. And, in certain cases, you could be right. George Balanchine, the prolific choreographer, once said, “My muse must come to me on union time.” In other words, productive creativity requires dedication. But you also need to stay inspired to achieve your goals, and taking a break can help you in countless ways. Here’s why: A lot has been written on the topic of innovation. No one has quite put their finger on the elusive concept, but a few have identified ways we can maximize creativity and foster innovative thinking. One of the best ways to spark innovative ideas is to make connections between seemingly disconnected things. And to do this, it helps to step away from your project and do something else entirely, even if just for a moment. Taking a break from your project might be as simple as stepping out for a walk or heading to a local coffee shop. It might be a weekend away in a different city. Or it might be experimenting with a different art form like painting or music. Whatever you do, taking a break can help you look at your story through a new lens. 5. Don’t wait for the perfect moment. Get started now. Filmmakers often have that one special story they’ve kept on the backburner. You know the type of project we’re referring to. It’s the story you always talk about — the one you were born to tell — but you’re just waiting for that perfect moment to get started. You might be waiting for the right gear, the right team or some other elusive variable. But you’re still waiting. And while you might have a legitimate reason to put things off, the reality is that you’re probably just procrastinating. Us storytellers often have elaborate and compelling reasons for why we can’t finish this particular project. But when it comes down to it, they’re mostly excuses. So, one of the best ways to be counter burn out and be challenged creatively is to get started — right now. If you have a story you’ve only been talking about, take this as your cue to get started. You’re a talented filmmaker with an amazing story — you can do this. Don’t wait a moment longer to tell the story you were born to tell. How do you fend off burn out and keep the creative spark alive? Tell us how you stay inspired in the comments below. First impressions of the Easyrig Mini.